Don’t let looks deceive you; this simple looking meal is a powerhouse on different levels. The awesome combo of healthy fats + protein + complex carbs will leave you very satiated for a long time. That’s assuming you refrain from visiting the donut table in the break room. 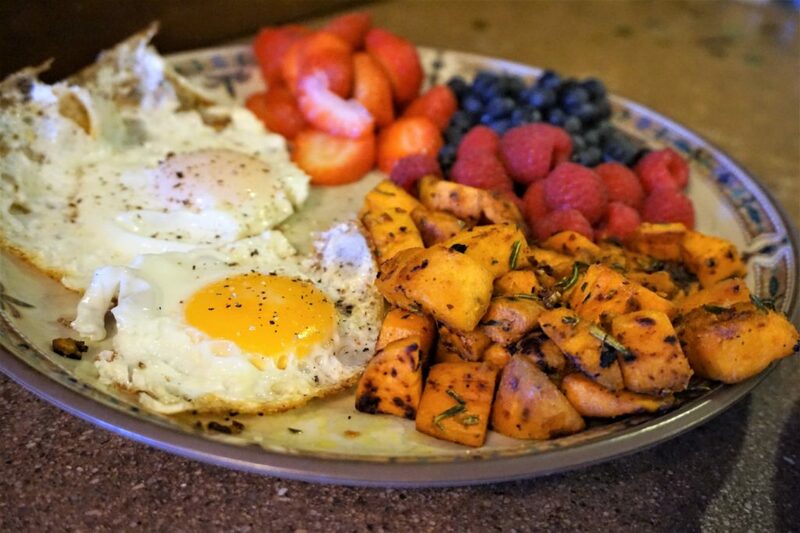 This breakfast (or, hey, dinner, if you want!) will not put your blood sugar on a roller coaster ride, leaving you hangry. One of the best parts is that this will make several meals. There are 2 parts to this recipe. You can prep the entire thing at the beginning of your week and pull from that to make breakfast each day. Preheat oven to 425 degrees F. Wash and peel the yams, then cut into 1″ cubes. Place the yams in a large bowl and drizzle with the olive oil, throw in the garlic, rosemary, salt and pepper. Stir until combined well. Spread evenly on parchment paper on a sheet pan. Bake in oven for about 30 minutes, until soft all the way through. In a large skillet (that has a lid!) over low heat, place 1/2 Tbsp coconut oil, turmeric, and the 1 cup yams, stir to combine everything. Warm the yams for 5-8 minutes, stirring occasionally. While they are warming, carefully crack the eggs into a bowl (don’t break the yolks! ), adding salt and pepper to taste. Also at this time, prep your plate with desired berries. Once the yams are warmed through, you can either plate them or continue with this next step. I like to crisp-i-fy the outside of my yams by turning the heat up to low-medium after they’ve been warmed, stirring consistently so they don’t burn. If you’d prefer softer yams, feel free to skip that step. Spoon the yams onto the prepped plate, leaving the burner on at low-medium heat. Place the other 1/2 Tbsp coconut oil in the skillet, letting it melt, if it was solid (won’t take very long). Add your eggs to the skillet (making over easy eggs will be trial and error if you’ve never done it, especially since all stoves are different). I let the eggs simmer for about 60 to 90 seconds, letting the edges of the whites harden. Turn off the burner and place a lid on the skillet, letting them sit for right around 3 minutes. Check to be sure the whites are solid before serving and top with additional salt and pepper, if desired. If you have any questions (or want a different method – there are quite a few out there) on how to make over easy eggs, Dr. Google has a lot of information. If you want to put a kick in your breakfast, I know crushed red pepper flakes are awesome in this as well. Start out slow (like a small pinch) and work on up from there, if you’re not sure on the amount. This meal is a HUGE hit with our 2 year old, so if you’re looking to mix breakfasts up for the fam/yourself, I hope you give this powerhouse plate a try. 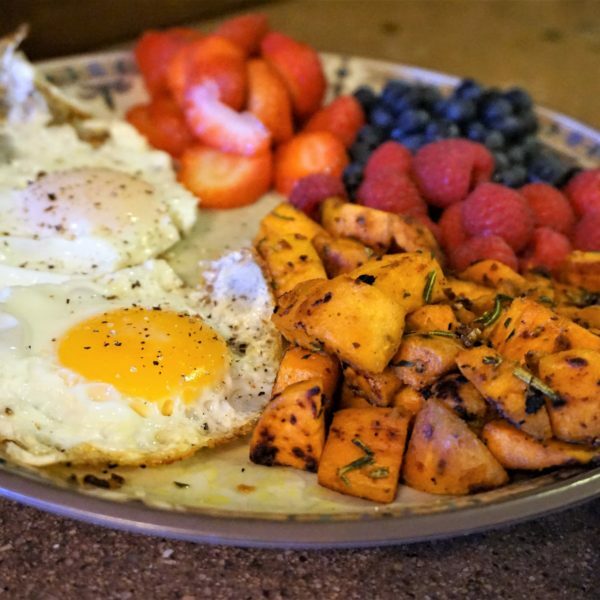 YOUR STORIES | breakfast, brunch, eggs, food friday, sweet potatoes, weekend | November 9, 2018 .